So, I’ve had a chance to actually look at my schedule over the next two weeks, and it is extremely unlikely that I will be able to post next week. So I guess this is my cue to wish everyone a happy holidays, and I shall see you on the flipside in 2017, when we will do year-end/year-beginning stuff for about a week and then dive back into the publishing/submitting posts (where we will discuss self-publishing short stories to begin with. So, Jan 3. I shall return. Til then, I was up late making peppermint bark, so I drew you a peppermint bark-making landsquid. 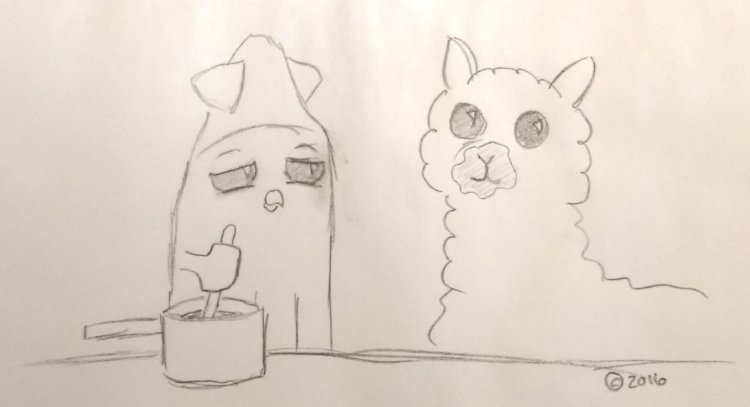 He’s supposed to be eying the Alpaca suspiciously. Oh well. Things to practice. Squinty eyes. I was talking to a few friends last night about whether or not I should do a holiday post today or whether I should start the year-end stuff, and the general consensus was to do the holiday post, at which point I noted that I would draw a landsquid for the post. 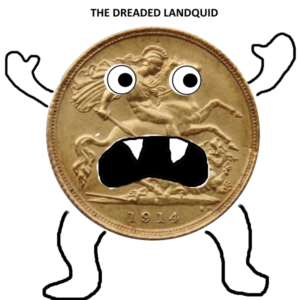 So, in celebration of a hilarious typo, I made you all a landquid. Just for you, Di. Happy holidays, everyone! I’ll see you on the other side! Around this time of year, I occasionally get a bit nostalgic, and various childhood memories sneak in here and there. Last week I was at the Tattered Cover with the small, mobile ones buying gift cards for the larger mobile one’s teachers. The Tattered Cover is a local bookstore chain. The original store I was familiar with was in a fancy shopping area called Cherry Creek, and I would swear we practically lived there when I was little. The original Tattered Cover was amazing. If my memory serves me–and it may not–it was a towering bookstore, four or five stories tall, not counting the basement, and it was a chaotic mess. There seemed to be little order to the sections, and you’d often have to explore multiple levels, with their maze-like shelves, to find what you were looking for (provided you were looking for something specific). For a small bookworm, it was heaven, equal parts mystery and adventure. There are other places that have stuck with me over the years. What is it about these places? I think it’s that they all have a little bit of magic to them, something that makes them a little different. These can be places you’ve been a million times or a place you’ve only seen once. I was going to make this a reading analogy, about how some stories stick with you, even years later, but I’m not quite sure it’s necessary. But it’s good to have a little bit of magic in our lives, and perhaps it’s most important to remember that through the holidays, when tensions run high and stress threatens to drag us all down. If you have one of these places still, maybe it’s worth it to take the time to spend some time there, to let the magic wash over you as much as possible. What are some of the magical places in your life? Today it’s my pleasure to introduce Captain Hawkins by H. Peter Alesso. Pick up the book here! My mother recently moved out of my childhood home to move in with my grandmother, which means I had to go through the stuff I accumulated throughout the first portion of my life and then abandoned when I went out on my own after college. A good majority was Star Trek-related–action figures, ship models, tons of roleplaying stuff, and books. LOTS of books. Nonfiction books about how the series were made, nonfiction books like The Physics of Star Trek (and Biology, and Metaphysics…), and most of my collection of the fiction books. Most of mine are Original Series, which was always my favorite series to read from, with the odd one or two from Next Gen or DS9 or Voyager (I did have a lot of the New Frontier books, which is Next Gen era but on a different ship with different characters, though some of them had appeared one off on various episodes). Actually, until I was an adult, I’d only ever seen one or two Original Series episodes. My appreciation for the series came from the movies and the books. And I did love those books. But the Original Series books are a mixed bag. Not a lot of quality control. Some are amazing. Some are godawful. Most fall somewhere in the middle. So this brings us to The Klingon Gambit, Star Trek #3, by Robert E. Vardeman, published in 1981. I admit I picked this one out because it was one of the thinnest of the bunch, but it turns out the font is really small and so it’s somewhat hard to read. I am unfamiliar with Vardeman’s other works (except I’ve probably read his other Star Trek novel) but he’s apparently written quite a few fantasy series (usually writing with other people) and was nominated for a Hugo for best fan writer. If his other stuff is worth reading, let me know–I’m not sure this particular novel was a good display of his potential storytelling. The premise of this novel is that the Enterprise is sent to Alnath II to investigate the death of a shipful of Vulcans. All the Vulcans are dead in their beds, with no sign of any issues–there should be no reason for them to be dead, but they are. A Klingon dreadnought is in orbit, and the fear is that they’ve developed some new weapon. There is also an archoelogical team on Alnath II, investigating a large, complex pyramid that seems to be the only remains of what was once a technologically-advanced civilization. This is not one of the better Original Series novels. Several characters feel out of character (there is a subplot where people are acting out of character, but this is apparent even when that subplot is not in effect), and I feel like perhaps the author was a little bit amused about Star Trek in general. I noted, for example, that every time someone uses the transporter, we had to focus on the fact that their atoms were scattered and then reformed back on the planet. In general, some of the terminology just feels slightly off. Now, this is probably just from me looking back from the future. The Original Series is not the best on continuity, and it wasn’t until Next Gen and later that a lot of the worldbuilding for the universe was solidified. Next Gen didn’t start until 1987, so this significantly predates that. It was probably hard to figure out what exactly was going on back then. I also found the plot pretty predictable, and also somewhat close to at least one, if not two, Original Series episodes (as a kid, having not seen those episodes, maybe I liked this plot better). Also Kirk seemed to not be suffering from one of the major plot issues despite the rest of the crew doing so, and if he had been, maybe the stakes would have been a little more interesting. So, would I recommend this particular book? Not really. It’s not great in Star Trek terms, though it does at least use Star Trek plot elements, such as the Klingons and Andorians. It got better as it went on, but it still wasn’t strong in either plot or character. There’s definitely better books out there. Read this particular Trek novel, Squiders? Thoughts? Here’s our final stop on this particular story type/publication method combination, Squiders. Like anthologies, short story collections are, as the name implies, a collection of short stories. The main difference is that an anthology features the work of multiple authors, while a short story collection includes the work of only one. As such, short story collections tend to operate more along the same principles as novels than selling a single short story at a time. The first step toward submitting and publishing a short story collection is to have written a number of short stories. These can be ones that have been previously published, or they can be new ones. A number of stories is necessary; most traditionally-published collections are equal in length to novels. These stories can be related, such as all featuring the same characters, or the same universe, but they do not need to be. If you have an agent (see agents section–note for blog: not written as of yet, so don’t be confused that you can’t find it), you can have them submit to publishers for you; some publishers will accept submissions from unagented authors. Like novels, you will need to write a query letter that you or your agent can send out. The query letter will need to have statistical information about the collection (number of stories, word count, genre if possible, etc.) as well as some sort of hook to inspire a publisher to look closer at your stories. An interested publisher may ask for a sample, or may ask for the entire collection to aid in the decision-making process. NOTE: Short story collections are notoriously hard sells, especially if you are not an established, traditionally-published author. Publishers typically find them hard to market, and readers may not pick up a collection if they are not previously familiar with the author in some way. Previously published stories may be an easier sell in this case, especially if they’ve been published in top-tier markets or have won industry or genre-specific awards. Alternately, short stories that are linked to a novel series can also be easier sells, since readers are more likely to seek them out to augment their reading of the series in between novels. A publisher will have a contract you will need to agree to before they’ll publish your collection. If you do not have an agent, you might consider asking one or a rights-specific lawyer to look over the contract to make sure that you’re getting a fair deal. Some publishers will pay some amount of money up front, called an advance. You have to “earn through” your advance before you can start earning royalties. Others may not pay an advance at all. All right! That’s it for traditionally publishing short stories. Please let me know if you feel I’m leaving anything out, or if anything is confusing. I’m going to take about a week off of the book posts (I’m reading a terrible Star Trek novel to share with you guys on Friday) and then we’ll jump into self-publishing short stories (which is a massive beast). And then another break from those sorts of posts and then into the novels, egads. Continuing on from Tuesday. If you missed that post, I recommend clicking the handy link at the top or bottom of this entry (depending on whether you’re on the blog or website) or simply scrolling down and reading that one first if you’re on the main blog page. An anthology is a collection of short stories (or longer works, such as novellas) that center around some sort of theme. These themes can be very specific or very broad, depending on the publisher and the particular anthology in question. Publishers that regularly release anthologies may have the next several themes available on their website so you can plan ahead. You can be invited to submit work for an anthology. This is more common if you’re an established, decently-selling author who has been traditionally published by major markets, or if you’ve worked with an editor before and they’ve been impressed with your work. Like magazines or journals, market websites like Duotrope and the Submission Grinder list open anthology calls on their websites, and you can search specifically for anthology markets by using their advanced search function. Anthology calls often have a deadline associated with them (i.e., stories must be received by November 15), though some publishers may keep submissions for a particular anthology open until they feel they’ve received an appropriate amount of acceptable submissions. Often, an anthology call will also include the intended publication date for the anthology. Pay rates for anthologies follow the same methodology as magazines and journals, falling into pro, semi-pro, token, and non-paying or exposure. Anthologies are more likely to pay a flat rate per story, and also may include a copy or two of the anthology. Some anthologies may pay authors a share of the royalties, either as the main form of payment, or in addition to whatever the original buying rate was. Some anthologies are created to make money for charitable causes–the submission guidelines will normally specify this. Like magazines and journals, you can try to fit a previously written story into an anthology, or write a story specifically to match an anthology theme. NOTE: Depending on the anthology theme and how specialized it is, it may be hard to place an anthology-intended story elsewhere if the anthology does not accept it. In many cases, the submission process for an anthology is similar or identical to submitting to a magazine or journal, with most using either an email submission process or an online portal. An anthology may accept a wide variety of story lengths or be focused on a specific type of short story (such as flash fiction), and pay rates may be different depending on the length of the story. For example, some anthologies may pay a pro rate for very short works, such as flash or micro fiction, but pay semi-pro or token for longer works. If your short story is selected for inclusion in an anthology, the publisher will send you a contract specifying rights and when/if the rights will revert to you after a certain period of time. The editor or publisher may also ask for some edits to be made to the story. These are normally fairly minor–small plot issues or copyediting–as the time frame and demand for an anthology does not allow for more major changes; if a story is not working on a larger level, it is very unlikely to be selected. Here’s part 2, Squiders! Again, let me know if anything is confusing or if you feel I’m leaving something out, or let me know if the format isn’t working for some reason. I’d hate to go through the whole thing if the format is inherently wrong! Otherwise, we’ll continue next Tuesday with the third and final part of traditional short story publishing and then take a bit of a break on the subject before we jump into self-publishing short stories. Otherwise, I hope you have a happy weekend, Squiders!